This project was done for LMC-6755 Discovery & Invention, taught by Prof. Nassim JafariNaimi. The goal of this project was to take a transitional space and produce a visual map representation of this space. My group chose the transition of language as our transition space of interest. We started the brainstorming process by discussing different transition spaces that were interesting to us over Facebook Messenger. Language quickly appeared to be a favorite for all three of us, specifically with regards to translation. Xu and I both have experience navigating the transition between Chinese and English, and Charlie has experience translating Greek and French into English. Given that this was a shared experience for all three of us that was also rich in depth, we decided to pursue language as our transition space of interest and see how our experiences compared visually. For the first draft, we worked on maps that explored and portrayed different aspects of our respective experiences with language. My maps were rooted in my relationship with Chinese as a secondary language that I have been raised alongside for my entire life. Although I grew up with Chinese language constantly being spoken around me, my own understanding of the language is actually rather underdeveloped. The first map I made displayed how I envision my navigation of the Chinese language with colloquial speech being pretty straightforward, idioms requiring navigation of the cultural literary twists and turns, and technical terminology being a complete mess to make sense of with no real sense of an exit. The second map was a simple linear map showing my mental process of translating from my primary language of English into Chinese. I first work out what I am trying to say and who I am speaking to, move into the transposition of English grammar to Chinese, and finally identify the correct tone to use for each Chinese word I am using. Given the simplicity of this map, I was disappointed by how much of this process I had overlooked and left out. The process of translation for me is not nearly as simple as this map lets on. I consistently make mistakes in all parts of this process so it is not nearly as linear and straightforward as this map shows. The final map from my first set of drafts was an exploration of my experience of code switching between languages based upon my interactions with different groups of people. I tried to make a rudimentary railroad map with the ending stations being the different forms of language I use and the branching paths representing the different switches I need to navigate to figure out how to speak to someone. However, I think the visual language of this map is rather convoluted with a lack of consistency of how paths and stations represent different factors in my code-switching process. Following the feedback we received for our first drafts, we each chose one of our three initial maps to refine. I chose to refine my map of code switching and explore different options to portray that experience. I started off by exploring a new metaphor for code switching where language exists as a mechanical system with all sorts of switches and dials to convey the variety of options available when we converse. However, I felt as though this metaphor lost the importance of the different people I interact with in relation to that decision. For that reason, I turned back to the metaphor of the transit map. The following two maps were made in Adobe Illustrator and imitate the visual language of traditional transit maps. 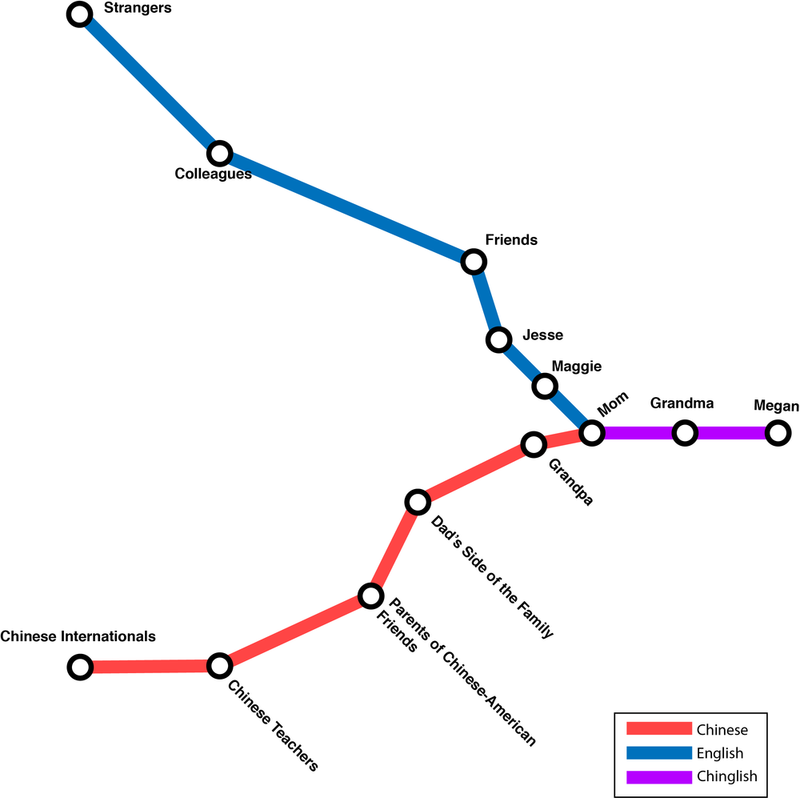 My first iteration showed a crossing of lines representing the two different languages, with the stations shared between the lines representing people I interact with in a combined form of Chinese and English. The main issue I had with this map was a lack of directionality to guide the reader through the map. I tried to resolve this in the next version of the map where the two lines meet at a point of convergence. From that point, the lines no longer share stations, but instead they combine into a new line to show a distinction between that combined form that I affectionately call Chinglish and its component languages. During the critique session of these maps, I received valuable feedback regarding the visual language of transit maps and how it conflicts with the topic I am trying to portray in my maps. Traditional transit maps intentionally use standardized visual language between all stops to convey simplified legibility. However, this does not convey any distinct information between the stops which is crucial when thinking about how I talk with the different parties at the stops. How I speak with my sister is very different from how I speak with strangers even though I converse with both in English. This difference should be portrayed in the visual language that I use. After reflecting on the feedback I received in the previous critique session, I realized that I needed to expand outside of the transit map metaphor to fully capture my experience navigating language in relation to who I am speaking with. For this, I found inspiration in a Tang dynasty poem that depicts a traveler’s journey down a river. My final map portrays my own journey through language as a transition between the rigidity of traditional transit maps and the natural flow of rivers. I used the words of the poem in its original Chinese and in my English translation as the pathways connecting the stations of people with whom I speak that respective language. The two versions of the poem converge into a mixture of Chinese and English, similar to the form of Chinglish that I occasionally use. The transition between rigidity and natural flow is also conveyed in the typography used across the map and the symbology used to depict the people I interact with. When presenting our maps as a group, there was some miscommunication regarding the dimensions of the final maps and the materials used to display them. That aside, our three maps did share some common themes which allows them to work cohesively as a unit. There is a shared element of depth between the three that conveys multilingualism as a multidimensional space for the speaker to operate in. Overall, I am pleased with the maps that we presented, though there is definite room for additional improvements and refinements. Besides cleaning up the overall presentation of the map, I would have liked to explore the symbolism used in the poem more and improve the depiction of the transition between mechanical and natural forms of speaking. I also think my group could have done a better job cohesively in providing a sense of directionality between our three maps. Doing this would have made it more obvious to the audience that our three maps are to be interpreted as a unit all addressing the same transitional space.